Set in the near, but not too near, future, Interstellar paints a picture of a world that is dying, trying to kick us off. As a result, Matthew McConaughey’s character Cooper blasts off with some other intrepid explorers through a newly discovered wormhole that transports them to a place light years away where there are planets that are potentially habitable, that we as a species could possibly call home. Along the way the crew stops by a couple of different planets and experience all kinds of crazy time anomalies, like an hour of their time corresponding to years for those left back at home on Earth. 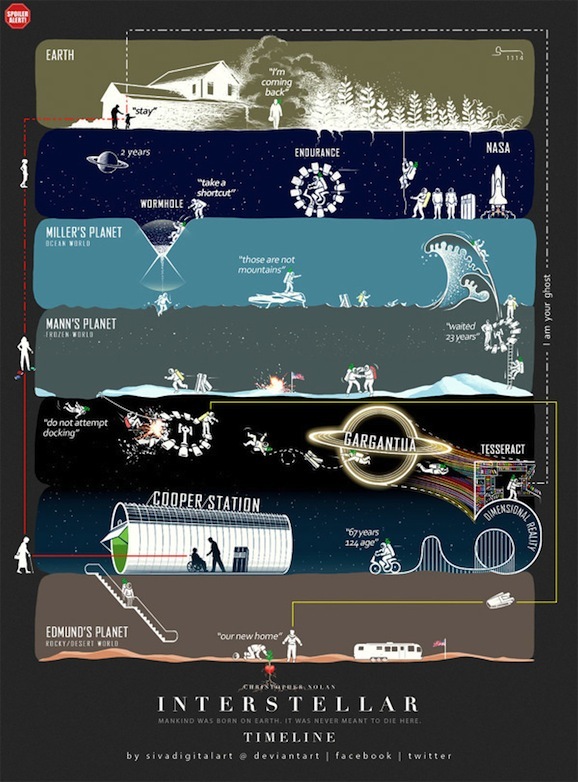 As you can imagine, things start to get jumbled, and it’s the aim of these infographics to smooth that out for you a bit. The end goal is the same, though they take very different paths to get there. The first one, from artist Siva Kumar, takes you chronologically through the film top to bottom, with a handful of spiraling asides that loop around and around again. It’s full of fun little flourishes, like the snippets of dialogue (“those are not mountains”) and an interdimensional roller coaster. To be honest, it actually looks a little like a board game, which could be a pretty cool way to spend game night. 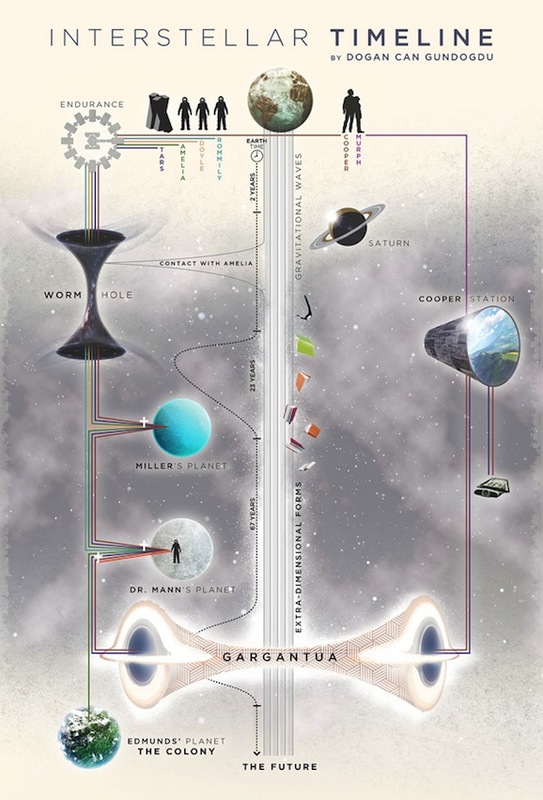 The second image traces the timeline many of the key players, including where they go through the wormhole, how they relate to each other, and where the parallel, intersect, and diverge. Created by Dogan Can Gundogdu, you can pick a character, say Cooper, his daughter Murph (Mackenzie Foy and Jessica Chastain depending on where in the movie you are), Amelia (Anne Hathaway), and even the sassy robot TARS, and follow their path through the film, time, and space. 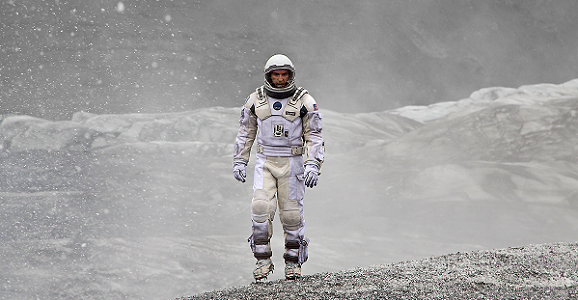 Interstellar is now in theaters everywhere. It’s crazy to think that a movie that has earned as much money as it has can even be considered to be underperforming. If you’re a filmmaker and that’s the case, you can rest assured that you’ve done some rather remarkable things earlier in your career. is released? Wouldn’t it just have been alot easier (and cheaper)to do it when they were making the damn thing?